Most school districts are now posting teacher absences on the internet. As a substitute teacher, you are stuck at your computer waiting for jobs to become available. This makes it very difficult to get the jobs you want. It doesn’t have to be this way. You can be alerted immediately after a job is posted, even when you are away from your computer. Alerts can be delivered as an email, text message, and audio alarm to your cell phone, tablet, and computer. This is the idea behind SubSidekick. SubSidekick continually searches for jobs and alerts you when one is found. The alert contains the job details and a direct link for you to quickly accept the job. SubSidekick helps you find the exact job you want. Its smart filters let you choose which jobs trigger an alert, based on the job title, school, employee, and assignment length. You can free yourself from your computer by letting SubSidekick do the hard work for you. Our Apple iOS app and Google Android app quickly alert you of new jobs. You can then quickly accept any jobs of interest. The text message gives you all the details you need about the job in one text message. You can quickly accept a job by using the direct link to the job accept page! The email message gives you all the details, exactly as you are used to seeing them. You can quickly accept a job by using the direct link to the job accept page! You can configure your settings and filters to reduce the amount of notifications that you receive. Why be bothered with jobs that you are not interested in? 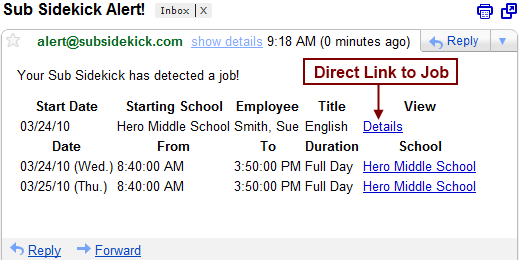 The keyword filter allows you to only include jobs with certain job titles, school names, and/or employee names. The time filter allows you to only be alerted when a full day assignment is available. *Your school district must be using Frontline Absence Management® or SubstituteOnline® as their substitute placement and absence management system. Is your school district using another service? Let us know and we can add it. **Requires that your computer is on and SubSidekick's job alert page is open. Unlimited Frontline Absence Management® and SubstituteOnline® accounts. 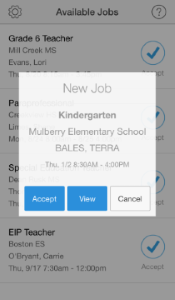 Receive text message and email alerts when a job is available. Use keyword filters to only receive job alerts that interest you. Copyright © 2013 Gooding Services LLC. All rights reserved. Frontline Absence & Time®, AESOP®, JOBULATOR™, and SubFinder® are trademarks of Frontline Technologies Group LLC. SmartFind®, SmartFindExpress®, and SubstituteOnline® are a trademarks of PeopleAdmin, Inc.
SubSidekick is not affiliated or endorsed by these products or corporations.